This is very interesting as something that can only happen in this day and age. Some of these gangs probably mean serious business but, I would not under estimate the power of established, well known, professional hackers with a track record of infiltrating almost anything they've said they wanted to and with how fast you can distribute and direct information on the internet, they could do some serious hurt if they revealed sensitive information. The problem is, this "anonymous" group is nothing new, you can look up stuff about them. That is the problem with them, they are pretty much anonymous. They exist, they don't really get caught. But they make themselves known and have demonstrated their skill to hack/back up their threats on high levels. Whereas a literal street oriented gang probably does not have the means to even make action against a group of people who could exist not even locally but collectively on the online world in many groups. It almost sounds ridiculous to think a group of hackers can really out-threaten and cause greater damage to a street gang but that may be where the digital world is heading as far as what mastery holds the most power. The article doesn't mention but it sounds like the gang just F'd with someone they didn't know was associated with the Anonymous 'collaboration'. It's crazy but you have to crack a smile when you really consider in 2011 a street gang might be in huge trouble cause they F'd with the wrong tech geek. Will be interesting to see if following articles or actions are made about this. It would seem that the Zeta's might, and I stress, might, be on their way out. If I understand the situation, the government as, quietly, aligned itself with the Sinaloa Cartel. What do they Zeta's have going for them? Well, it would seem that quite a few of their number might actually be competent former military, or maybe even former intelligence, operators with, as they say, "trigger time" and other experience in relevant fields (i.e. human intelligence gathering, analysis, counter-intelligence experience, etc.). That's my understanding of what the Zeta's bring to the table, anyway, which personally gives me a HUGE amount of healthy respect for them. All that considered, I think it would be wise for the Zetas to release this person, as well, and perhaps even extend a willing hand to online hackers looking for potentially lucrative business opportunities. They seem to have enough enemies already. These types, they may have that "bring 'em on" mind-set, though. It's a flaw in their thinking, I suspect. It'll be interesting, as has been said, to see how this develops. An Anonymous source told CNN that there were discussions about three weeks ago in Anonymous' main online chat portal that suggested that Anonymous members based in Mexico were going to target the Zetas. The source said that Anonymous Mexican members claimed in online discussions to have information about politicians in Mexico who were corrupt and working with the Zetas. Anonymous members in Mexico appeared, based on their portal chats, to want to make this information available online, the source said. I'm curious as to how much solid information they could gather on this cartel, though. Perhaps their plan is to use information that spreads through word of mouth to expose these criminals, and not by means of hacking? If it's the Mexican members of Anonymous that are supplying the information, it would seem that that could very well be the case. That is rather dangerous territory there, considering if they are misinformed they will likely be causing the deaths of innocent people. Lets hope, if members of Anonymous do carry through with this threat, that they make sure to get their facts strait. It would be really awesome if they found hard evidence against the people they accuse, so that authorities have something to go off of. However, without hard evidence against the these people it would be awfully reckless to make such accusations. That's my understanding of what the Zeta's bring to the table, anyway, which personally gives me a HUGE amount of healthy respect for them. Also, I think it's important to note that the Zetas have targeted journalists and bloggers in the past, and have threatened to continue doing so. I've also read in another article that they are known to recruit computer majors fresh from college. I don't know if that last bit is true, but it's something to take into consideration. Just because Anonymous members are hiding behind a computer, does not mean they are out of reach of the cartel. This is particularly true of the Mexican members that will likely be supplying the information. Anyway, this is a very interesting article. It's definitely something to keep an eye on. Well, by respect, I mostly meant respect for the power they possess. You might feel, perhaps correctly, that they're just street thugs who got a break, but we all know there's so much more to it than that. Yes, the Zetas hierarchy is probably dominated by such people, but it is curious to consider what will happen if the more intellectual, academic types being recruited into the organization begin adapting to the conditions of such a job, and start to work their own way up? In fact, if what I said about the Zeta's earlier, being composed on some level of ex-professional soldiers, or intelligence assets, is as true as we might think, then it is already a foreshadow of things to come. These organizations are only going to grow in complexity, I suspect, as well as in their real, tangible ability to influence events, and otherwise make use of the power they wield through new mediums (i.e. the internet, perhaps?). Ah, and before you go saying you'd like to see them wiped off the face of the earth, consider what would come after, if not more of the same. "The devil you know" ... you know? That's very interesting to hear. I suspect they may be doing a lot of recruiting of college level individuals, especially in countries where even having a college degree it is hard to find proper work. I know I would be tempted, to say the least! When the Anonymous movement has a bad day, supporters get arrested. When the Zeta drug cartel has a bad day, nearly three dozen of its members are killed and dumped on a Mexican highway. Now the two worlds have collided: One arm of Anonymous has called out the Zeta gang for allegedly kidnapping a supporter. In a message posted earlier in October on the Anonymous Mexico blog, hackers that align themselves with the Anonymous philosophy promised to publicize the identities of Zeta collaborators, unless an unnamed supporter was freed. "You have made a great mistake by taking one of us -- free him," the group said in a video posted online featuring a person in a black suit, red tie, and trademark Guy Fawkes mask popularized by the movie "V is for Vendetta." The only information released about the allegedly kidnapped Anonymous supporter refers to him being part of Operation Paperstorm, a grassroots effort to distribute pro-Anonymous propaganda. The group that posted the video claimed it could identify journalists, police officers, and taxi drivers who collaborate with the Zeta crime syndicate. The gang, which operates in the eastern state of Veracruz in Mexico, has found itself embattled in a war over territory in the state's capital, also named Veracruz. In September, 35 bodies of alleged Zeta members were dumped out of two pickup trucks and onto a highway in Veracruz, purportedly by members of a rival gang. The group posted the video on Oct. 6. 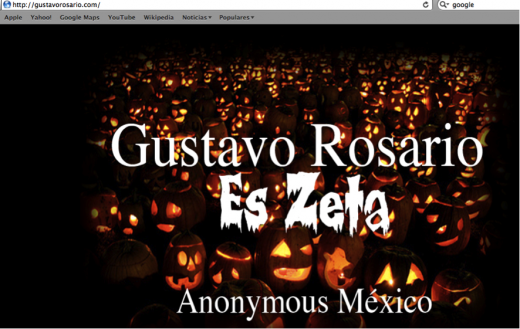 On Saturday, the website of former Tabasco attorney general Gustavo Rosario Torres was defaced, accusing him of being a Zeta collaborator. The accusations are not new, however: In 2008, anti-crime activists came forward with a taped conversation allegedly between Torres and a deputy talking about a $200,000 cocaine deal. It's unclear whether Anonymous has any new evidence against Torres. The threats gained attention after global intelligence firm Stratfor penned an analysis of the incident late last week. If supporters of the Anonymous movement accuse people of collaborating with the Zeta gang, it could put those named at risk, even if the accusations are false, Stratfor warned. In addition, any threats carried out by some of Anonymous supporters, who likely believe they are immune because they live in other countries beyond the reach of Zeta, could endanger supporters within the country, going beyond mere arrests, the analysis concludes. "Any Anonymous activists inside Mexico who are targeting or perceived as targeting the Mexican cartels will be just as vulnerable as online journalists and bloggers as the cartels seek to make them examples of what happens when someone exposes or publicizes damaging information about cartel activity," Stratfor writes. Zeta has not shied away from targeting its online critics. In September the crime group hung two people from an overpass with a nearby sign warning bloggers and "online snitches" to beware, according to Wired. Later the same month, the decapitated body of another social-media reporter was found with a similar warning. Worried about the impact on both misidentified people and Anonymous followers, other supporters of the Anonymous movement worked to dismantle the operation over the weekend. In effect, the group canceled the attack, according to online news site Milenio. But the fractious Anonymous movement is not of a single mind. A member known as Sabu has claimed the operation, codenamed OpCartel, will continue. "OpCartel is very much alive and like I said to others in private our war is on corruption on both sides of the spectrum. Vamos a GUERRA!" claimed the person going by the Twitter handle anonymouSabu. The Anonymous hacktivist organization’s Ibero-American wing has posted an update to its plans to unmask collaborators of the Mexican drug cartel Los Zetas, going so far as to post a series of security steps to attempt to protect bloggers participating in the #OpsCartel anti-cartel operation. Anonymous Iberoamerica says it is creating a "special task force" by invitation only. It is advising members to send messages through a proxy server or through Tor and is pleading with members to avoid identifying themselves as part of Anonymous. In addition, Anonymous has posted a widget that it claims will enable members to send “completely anonymous denunciations” regarding cartel crimes or corrupt authorities, which they pledge to investigate. The move to protect its members comes after rumors that Zetas plans to hire narcohackers to track down and physically retaliate against the hacktivists. Retaliation by this bloody, brutal cartel has already resulted in a body count: a man and a woman have been killed and hung from a bridge in Nuevo Laredo with signs warning against posting anti-cartel blogs. Another anti-cartel blogger, a girl, was found beheaded in Nuevo Laredo. An Anonymous member previously claimed that Los Zetas abducted a volunteer who was distributing OpsCartel leaflets in Veracruz, although the claim is being questioned due to lack of a police report or the abductee’s identity. Latin American members of the activist hacker group Anonymous called off a planned November 5 plan to expose people associated with the Zetas, Mexico's most violent drug cartel, according to the group's blog. In a post written in Spanish on the group's Latin American blog, the members said they had called off the action after the Zetas met a demand to release a kidnapped group member, and that: "We can say that, while bruised, he is alive and well." The hacker group said the person was freed with a note warning that if information were released, the cartel would make the kidnapped member's family suffer, and kill 10 people for each exposed name. Barrett Brown, a Texas hacker who posted details about the planned action, said via his Twitter account: "I will be continuing the fight against the cartels." "In the meanwhile, I will be going after other cartels with the assistance of those who have come forward with new information and offers of assistance," he said.